A Temple University freshman died and another woman was injured in a fall from a dorm building on a busy Philadelphia street Thursday evening. 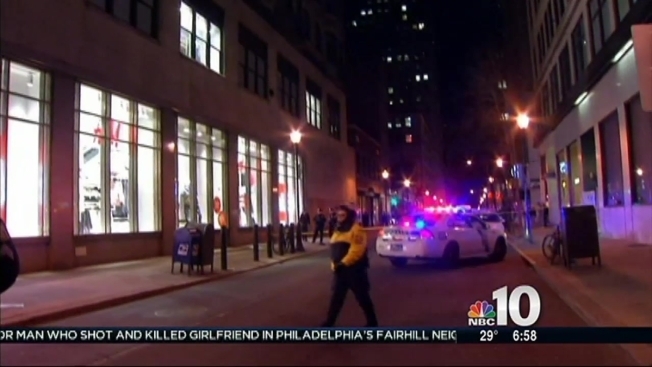 The deadly incident unfolded in Center City, outside the H&M store on the 1600 block of Chestnut St. Shoppers and pedestrians watched in horror as 18-year-old Rebecca Kim slipped and fell off the window ledge of an apartment building and landed on top of another woman, 44, who happened to be walking below at the time. "This is surreal to me," said a witness. "I can't even believe it." Temple University confirmed that Kim died Thursday evening at Jefferson University Hospital following the eight story fall. "It is with great sadness that I inform you of the death of Rebecca Kim, a first-year student in the College of Science and Technology," University President Neil D. Theobald said in a statement Friday. The pre-pharmacy student was visiting friends who attend the Art Institute of Philadelphia when she fell. "Temple University is deeply saddened to learn of the death of one of our students in Center City Philadelphia. Our thoughts and prayers are with her family and friends." Counseling for university students is available at Tuttleman Couseling Services. "It definitely gives you a reality check and make you want to call your friends and family because you just watched someone die," another witness said. The injured pedestrian was taken to Hahnemann Hospital. She has a broken vertebrae and missing teeth.